ClusterControl consists of multiple components and one of them is the user interface, a web application running on PHP platform. Some customers had concerns since PHP 5.x was deprecated early this year. 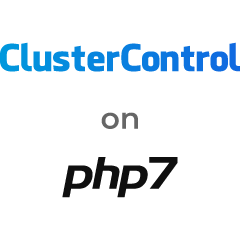 This blog post shows you how you would run ClusterControl on PHP 7.x. What's up with PHP 5? PHP 5 has reached the end of life on January 1st, 2019. Each release branch of PHP is fully supported for two years from its initial stable release. During this period, bugs and security issues that have been reported are fixed and are released in regular point releases. End of life (EOL) simply means the release is no longer supported. Users of this release should upgrade as soon as possible, as they may be exposed to unpatched security vulnerabilities. It is probably the right time to upgrade the PHP at least up to version 7.1 to avoid security concerns and get peace of mind when running web applications. ClusterControl will be installed on top of PHP 7.3. There are a number of third-party repositories that offer PHP 7 installation like Webstatic, RPMFusion and so on. However, using the Remi repository is the best option we got considering it requires zero modification to the ClusterControl installer script. install_packages="`echo $install_packages | sed 's/php5/php/g'`"
You will end up with PHP 7.2 installed, which is good enough to run the ClusterControl web application. For those who already installed ClusterControl with PHP 5.x, it's possible to upgrade the PHP version to the latest one. Basically, the same principle applies to what we described in the previous section. Re-login into the ClusterControl UI and you should be good. Re-login ClusterControl UI. It should be running on PHP 7.2 at this point. You may verify with phpinfo() page or using the "php --version" command. It's highly recommended to keep up with the active supported version for all dependencies of your applications. This ensures that you run the overall infrastructure with minimal security risks, and better performance.